On the 10th (Mon), pause for some photo ops at Casa Batllo, then stroll around Parc Guell, then pause for some serene contemplation at Basilica of the Sagrada Familia, and finally browse the fresh offerings at La Boqueria. Get ready for a full day of sightseeing on the 11th (Tue): take in the architecture and atmosphere at Barcelona Cathedral, then take a stroll through El Barri Gòtic, then admire the landmark architecture of Palau Guell, and finally appreciate the history behind Casa Mila - La Pedrera. For traveler tips, other places to visit, more things to do, and tourist information, you can read our Barcelona trip maker . Atlanta, USA to Barcelona is an approximately 12.5-hour flight. Traveling from Atlanta to Barcelona, you'll lose 6 hours due to the time zone difference. When traveling from Atlanta in June, plan for a bit cooler days and about the same nights in Barcelona: temperatures range from 79°F by day to 66°F at night. Finish up your sightseeing early on the 11th (Tue) so you can travel to San Sebastian - Donostia. On the 12th (Wed), wander the streets of La calle 31 de agosto, then take a stroll through Parte Vieja, then explore the historical opulence of Castillo de la Mota, and finally tour the pleasant surroundings at La Concha Beach. Get ready for a full day of sightseeing on the next day: stroll through Zurriola Beach, then pause for some serene contemplation at Iglesia de San Vicente, and then let your taste buds guide you at a local gastronomic tour. For traveler tips, other places to visit, more things to do, and other tourist information, you can read our San Sebastian - Donostia trip builder . Getting from Barcelona to San Sebastian - Donostia by flight takes about 3.5 hours. Other options: do a combination of flight and bus; or drive. Expect a bit cooler temperatures when traveling from Barcelona in June; daily highs in San Sebastian - Donostia reach 73°F and lows reach 60°F. Finish your sightseeing early on the 13th (Thu) to allow enough time to travel to Castelnaud-la-Chapelle. Kick off your visit on the 14th (Fri): contemplate the long history of Chateau de Castelnaud, then explore the historical opulence of Chateau de Beynac, then pause for some serene contemplation at Eglise de Notre Dame de l'Assomption, and finally step into the grandiose world of Chateau des Milandes. Here are some ideas for day two: take a stroll through Bastide du Perigord, steep yourself in history at Château de Biron, and then contemplate in the serene atmosphere at Cloitre de Cadouin. To find maps, where to stay, and tourist information, read Castelnaud-la-Chapelle trip itinerary maker site . You can drive from San Sebastian - Donostia to Castelnaud-la-Chapelle in 5 hours. In June, daytime highs in Castelnaud-la-Chapelle are 78°F, while nighttime lows are 56°F. 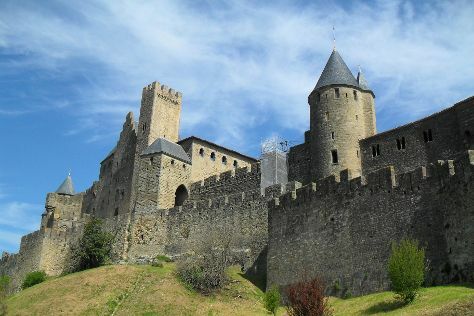 Cap off your sightseeing on the 16th (Sun) early enough to go by car to Carcassonne Center. On the 16th (Sun), pause for some serene contemplation at Eglise Saint-Nazaire, steep yourself in history at Cathar Castles, then step into the grandiose world of Cité de Carcassonne, then explore the historical opulence of Chateau Comtal, and finally take a stroll through Carcassonne Medieval City. Get ready for a full day of sightseeing on the next day: savor the flavors at Food & Drink and then explore the historical opulence of Chateaux de Lastours. To see more things to do, traveler tips, maps, and other tourist information, refer to the Carcassonne Center vacation planning app . You can drive from Castelnaud-la-Chapelle to Carcassonne Center in 3.5 hours. Alternatively, you can take a train; or do a combination of taxi and bus. Expect a daytime high around 79°F in June, and nighttime lows around 60°F. Cap off your sightseeing on the 18th (Tue) early enough to go by car to Avignon. Palais des Papes and Roman Theatre of Orange are good opportunities to explore the local culture. Abbaye Notre-Dame de Senanque and Pont d'Avignon will appeal to history buffs. Explore Avignon's surroundings by going to Pont du Gard (in Vers-Pont-du-Gard), Chateauneuf-du-Pape (Domaine de Beaurenard, Distillerie A. Blachere, & more) and Vieille Ville de Gordes (in Gordes). There's still lots to do: get to know the fascinating history of Ile de la Barthelasse. To find ratings, photos, and other tourist information, read our Avignon route planner. Traveling by car from Carcassonne Center to Avignon takes 2.5 hours. Alternatively, you can take a train; or take a bus. June in Avignon sees daily highs of 83°F and lows of 60°F at night. Finish your sightseeing early on the 21st (Fri) so you can take a train to Marseille. Kick off your visit on the 21st (Fri): take in the spiritual surroundings of Cathédrale La Major, get to know the fascinating history of Vallon des Auffes, then explore the striking landscape at Calanques, and finally take in the spiritual surroundings of Basilique Notre-Dame de la Garde. 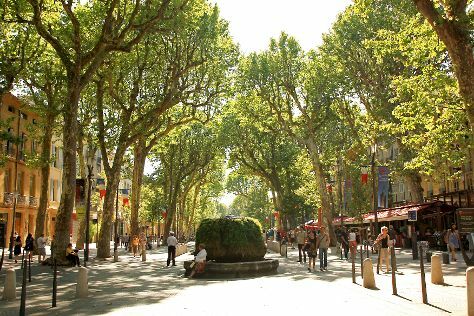 On the 22nd (Sat), you'll have a packed day of sightseeing: make a trip to Cours Mirabeau, then contemplate the long history of Paroisse Cathédrale Saint Sauveur Aix-en-Provence, then contemplate in the serene atmosphere at Abbaye Saint Victor, and finally take a stroll through The Panier. To see traveler tips and other tourist information, read our Marseille trip planner. Traveling by train from Avignon to Marseille takes an hour. Alternatively, you can drive; or take a bus. In June, plan for daily highs up to 83°F, and evening lows to 63°F. Finish your sightseeing early on the 23rd (Sun) to allow enough time to drive to Cannes. Popular historic sites such as Vieille Ville and La Croisette are in your itinerary. Saint-Paul de Vence and Le Suquet are good opportunities to explore the local culture. Explore Cannes' surroundings by going to St-Jean-Cap-Ferrat (Villa Santo Sospir & Villa & Jardins Ephrussi de Rothschild) and Nice (Musée Marc Chagall & Cathedrale Saint-Nicolas). There's much more to do: wander the streets of Rue d'Antibes, pause for some serene contemplation at Clock Tower of Notre-Dame de l'Esperance, and browse the exhibits of Chateau de la Napoule / Musee Henry-Clews. To find ratings, photos, maps, and tourist information, you can read our Cannes trip itinerary builder app . Traveling by car from Marseille to Cannes takes 2 hours. Alternatively, you can take a train; or take a bus. Traveling from Marseille in June, you will find days in Cannes are little chillier (78°F), and nights are about the same (61°F). On the 26th (Wed), wrap the sightseeing up by early afternoon so you can travel to Barcelona. On the 27th (Thu), wander the streets of Passeig de Gracia, tour the pleasant surroundings at Barceloneta Beach, then examine the collection at Museo Picasso, and finally appreciate the extensive heritage of Carrer Montcada. 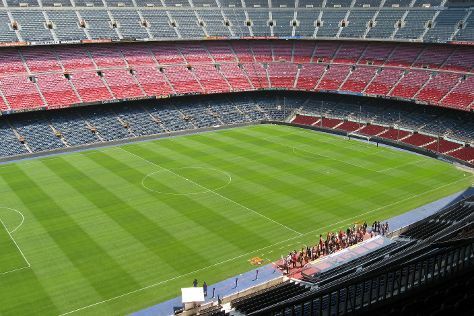 On your second day here, explore and take pictures at Camp Nou, then don't miss a visit to Las Ramblas, and then take a stroll through Ciutat Vella. For traveler tips, ratings, reviews, and more tourist information, you can read our Barcelona itinerary app . Fly from Cannes to Barcelona in 5 hours. Alternatively, you can drive; or do a combination of train and flight. Cap off your sightseeing on the 28th (Fri) early enough to travel back home.